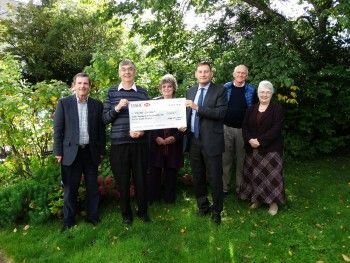 A charity which helps families cope with the loss of a loved one can increase its service thanks to a generous donation. Cruse Bereavement Care Cumbria was established to promote the well-being of bereaved people and to enable anyone who has been bereaved to understand their grief, to cope with their loss and to emerge with a sense of purpose for their future. Thanks to a grant from the Shepley Group Fund, administered by Cumbria Community Foundation, Cruse Bereavement Care Cumbria is able to increase the number of its volunteers in Copeland from 9 to 17. Shepley Engineers Limited established the Shepley Group Fund in 2009. The fund is now worth more than £115,000 and is a lasting legacy to Cumbria. The Fund supports small voluntary and community organisations across the county. Nick Houghton, Managing Director of Shepley Engineers said: “We established our fund with the express aim of providing support to those in need in our community. This grant to Cruse Bereavement Care Cumbria is a perfect example of how our fund can do this. We are pleased that it will help them provide more support to people in this area at a particularly difficult time in their lives.